The Coachman on its penultimate night. Chances are that if you haven't heard of Second City, you probably have and just don't know it. If you have ever used a 30 Rock gif to describe your life, quoted Billy Murray's character in Caddyshack, gotten your news entirely from The Colbert Report, or ironically or unironically used the phrase "win-win-win" from Steve Carrell in The Office, then you have benefited from Second City, Chicago's infamous live improv group. The full list of Second City alum reads like a who's who of the most influential, funniest comedians of the last fifty years. After earning their chops at Second City, alumni go on to act or write in TV (most notably Saturday Night Live) or film. Audiences flock to the shows, knowing that they can watch performances from some of the funniest people in the country––many of whom will go on to become nationally famous. 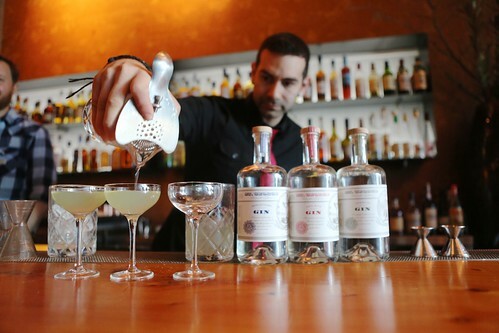 The Coachman—formerly known as Heaven's Dog—is San Francisco's Second City for cocktails. 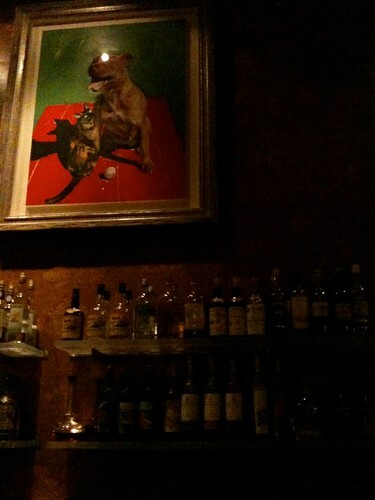 A sadly blurry picture from an iPhone 3GS during our first visit to Heaven's Dog in 2009. Heaven's Dog opened in 2009 in a dodgy part of San Francisco's South of Market neighborhood, about a block away from the city's main theaters on Mission between 7th and 8th. 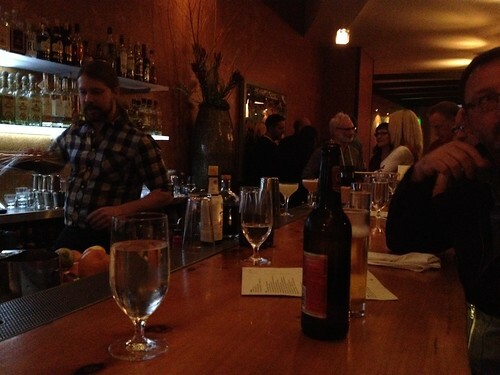 This sister restaurant to Slanted Door had opened with some fanfare. The craft cocktail scene at the time was small and young, and those who cared about good drinks on both coasts knew that with Erik Adkins at the helm, Heaven's Dog would be amazing. Erik was and is the Slanted Door group's beverage director, and by that time he had earned the respect of "mixologists" everywhere (remember when that term didn't make you sound like a d-bag?) for his encyclopedic knowledge of cocktails and their history, his meticulousness, and his almost supernaturally perfect execution. Heaven's Dog was built to be the cocktail geek's dream. It opened with a beautifully executed curation of Charles H. Baker drinks, ones that would become favorites in the craft cocktail crowd—the Fourth Regiment, an Improved Whiskey Cocktail (a Buffalo Trace old fashioned with a touch of absinthe and maraschino), the Bittered Sling (armangac, bitters, sugar, and nutmeg), and the Remember the Maine (rye, sweet vermouth, cherry herring, and bit of absinthe), for example, just to indulge myself in a few fond memories. It was one of the first places to use crystal-clear ice for every drink and to put a bar-wide emphasis on cocktail consistency. Even on the bartender's side, Erik designed the bar to be a thing of beauty—a "jet cockpit for making cocktails," as former bar manager Trevor Easter once called it. It was optimized for the bartender with the racks, sinks, glasses, and garnish trays in the most sensible and ergonomic places. And the bar itself was a long, handsome single piece of wood that was so large it had to be moved in before the front door was fully installed. Erik said that he would work onsite on the project, and funnily you could find him working as the host and zipping around to fill water glasses (which is how we met him). An old picture of Heaven's Dog under Trevor Easter. Taken with a iPhone 3GS, now an artifact of the past. The Coachman on its preview night. Heaven's Dog was eventually closed for a time after suffering a flood. Owner Charles Phan did away with the delicious Chinese food (Soup dumplings! Siu mai! Corn and pork! Vegetarian pork buns!) and recast it as a British gastropub called the Coachman. Cocktails were equally meticulous, but this time focused on inspiration from the Victorian Era with some real creative flair from Johnny Codd. Just one of Johnny Codd's inventive creations, a clarified gin flight. 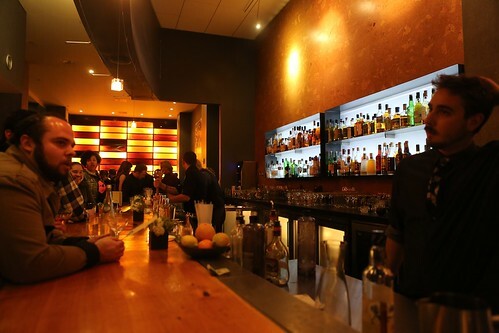 Johnny Codd took the Coachman in an exciting new direction––not just for the Slanted Door Group, but also for the city. Codd pushed the boundaries, coming up with Aviary-esque cocktails right in our own backyard. His clarified gin flight (three gin and clarified citrus cocktails served up), made-to-order Campari ice cream, and blended Negronis quickly became well known. His "secret menu" was an especially creative endeavor, including roast-your-own marshmallows, smoked spirits, and glasses made of Peychauds ice. At the Coachman, Codd could be as creative as he wanted, and Adkins encouraged and guided Codd's experiments. This is why losing the Coachman is such a bummer for San Francisco. Not only are we losing a great bar, but we're losing a pace for bartenders to master their craft with skilled mentors. 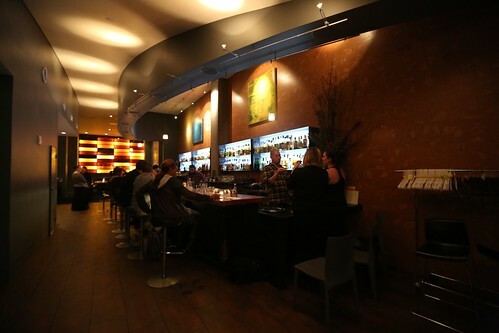 Over the years, the restaurant bought a celebrated cast of bartenders behind the bar—a mix of industry legends and those who would launch a formidable bartending career from there. Most had come as friends to Erik or as fans/proteges of him. The men and women behind the bar were equally incredible. Even the opening team was stacked with possibly unparalleled talent. Many were already established or went on to open some of the Bay Area's most renowned restaurants. They included Thad Vogler (owner of Bar Agricole and Trou Normand), Eric Johnson, Craig Lane, Chris Lane (who then headed up Lolinda, El Techo, and now Ramen Shop), Isaac Shumway (bar manager of Tosca), Jennifer Colliau (bar manager the Interval at the Long Now and owner/founder of Small Hand Foods), Erik Ellestad (of Stomping Through the Savoy), John Ottman (of Holy Water), Keli Rivers, and others. As much as the bar was Second City, Heaven's Dog/The Coachman was also a Cheers bar. It soon became an industry watering hole and cocktail enthusiast destination. You would often see bartenders on their dinner break or nights off come by for a drink, some dumplings, and a warm welcome. Drink nerds fans would glow from the firelight of flaming 151 for roasting marshmallows. For ourselves, personally, we learned so much from the six years we spent at the bar. We made new friends, rode a few bar coasters, watched Trevor weep in terror while making a blue blazer, created (and subsequently burned) Pedro with Isaac, enjoyed many a happy hour (and then happy evening?) over tiki drinks with Chris Lane, and had our first ever, mind-blowing negroni jello shot with Johnny as part of his hush hush menu. Friday night, The Coachman/Heaven's Dog closed. It closed quietly and quickly with little fanfare. There was no massive send-off, just a lot of tears from regular customers and staff alike. We've lost something special with The Coachman, and that is a lineage of bar managers and bartenders who were changing the way the Bay Area, and, yes, the nation, thinks about cocktails. We can only hope it is not forever. Video of The Coachman's last hour, as friends and family say goodbye.